Traveling east on Interstate 82 from Prosser, the first winery you encounter is Chandler Reach Vineyards (Benton City, 9506 W. Chandler Road; 509.588.8800; chandlerreach.com), an estate winery overlooking the Yakima River, the vineyard and Red Mountain in the distance. The winery’s architecture is a reflection of its Italian-style wines. The Tuscan villa houses the main tasting room and special events room. Relax on the patio and enjoy the cabernet sauvignon, cabernet franc, merlot, syrah or the sangiovese. 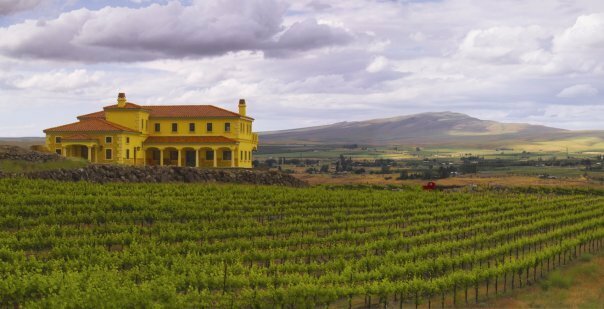 All of these wines showcase the balance and ageability of Yakima Valley wines. Private tours of the vineyards and barrel cave are available by reservation. Large groups welcome with prior arrangements. The Red Mountain AVA is a sub-appellation of the Yakima Valley. This small, burgeoning wine region is becoming a hot-spot for new vineyards. Red Mountain grapes—mostly Bordeaux and Rhône varietals—are among the most expensive and the source of an endlessly growing list of 90+ scoring wines. The following wineries are often the most popular for visitors during a tour of this small wine community.